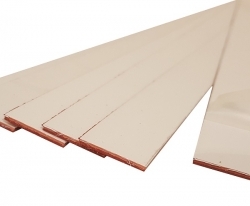 Limited availability for these pre-cut bundle packs of this rotary laminate. These 600mm long strips can be engraved and cut to suit your individual labelling requirements. For best finish use a saw or guillotine to cut. Alternatively the material will score and snap. These pre-cut strips are subject to a cutting width tolerance of +/- 1mm. Brushed grain direction can vary depending on strip size selected.